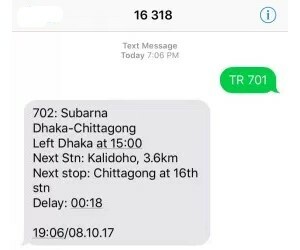 Bangladesh Train Location and Timing Check By Mobile SMS. Day by day Bangladeshi People enjoying Train Journy. But, maximum people are not knowing, what is the Bangladesh Railway Train Schedule, Ticket & Helpline Number. So, they are facing some problem to check Train Location. 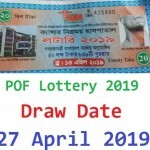 The Bangladesh Railway and Bangladeshi telecommunication mobile operator company are bringing a big service, whose name is the Bangladesh Train Location and Timing Check By SMS. Where people are know when the train left, What is its next station and how far it is now from its next station, What is its next stop, If the train is delayed, how much time is it delayed, At what time you are given this information, like as the same below picture. Are you searching how to check Bangladesh Railway Train Location, Timing, Delayed Time, Next Station by SMS? No tension, this is very easy, here below SMS System details. TR <Space> Train Number and Send to 16318. Example: TR 701 and Send 16318. After sending this SMS, the customer received a feedback SMS, where he/she know information like as the above picture. Note: The Bangladesh Railway Train Number is different for the same train for its direction. For example, when the Subarna Express goes from Dhaka to Chittagong, its train number is 702. But, when the Subarna Express goes from Chittagong to Dhaka, its train number is 701. If you want to check Subarna Express information, you need to type an SMS like as TR 710 or TR 702 and it send to 16318. Thanks for staying with us a long time and visiting Bangladesh Train Location and Timing Check By Mobile SMS content. If you have any question about the BD Train Timing, Location, Delayed Time? Just comment here. We reply as soon as possible.